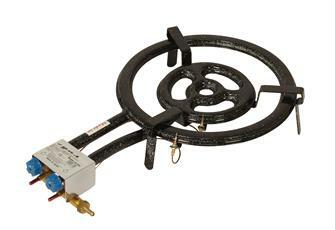 Paëlla gas heater with 1 ring, 30 cm in diameter. 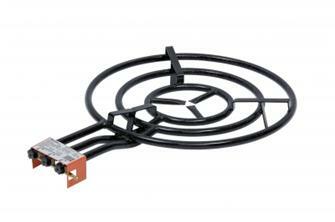 Power 6500 W.
Support stand for paëlla gas burner. 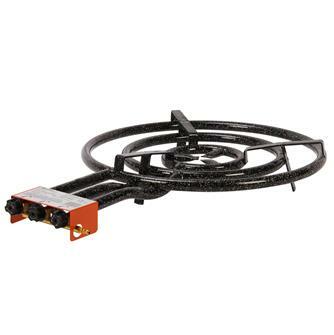 Paella gas burner, diameter 40 cm, 2 rings, power 11400 W.
Paella gas burner, diameter 50 cm, 2 rings, power 14,100 W.
Paella gas burner, diameter 60 cm, 3 rings, power 21,000 W.
Paella heater diameter 70 cm, 3 rings, 27,000 W power. 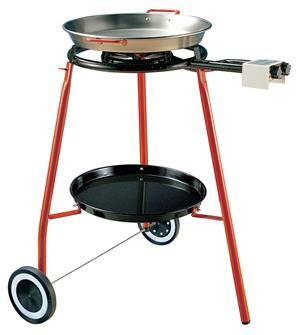 Adjustable stainless steel screen for paella heaters that are 30 to 50 cm in diameter. 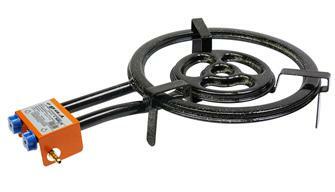 Paella burner that can adapt to a cooker - 25 cm in diameter. 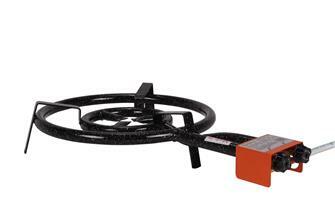 Professional 40 cm paella burner. With double perforated inside rings, the flames come out of each side of the tubes. 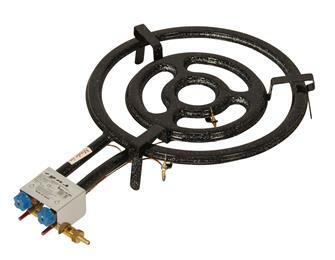 Professional 50 cm paella burner. With double perforated inside rings, the flames come out of each side of the tubes. 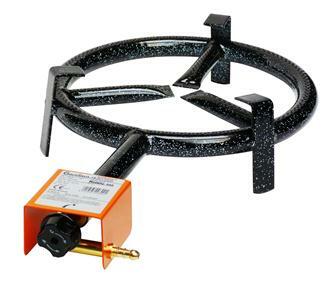 Professional 70 cm paella burner. With double perforated inside rings, the flames come out of each side of the tubes. 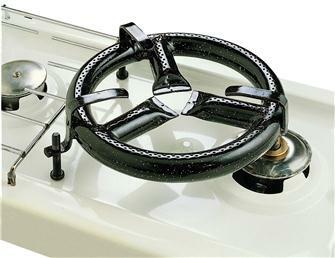 Pro paella burner - 30 cm. 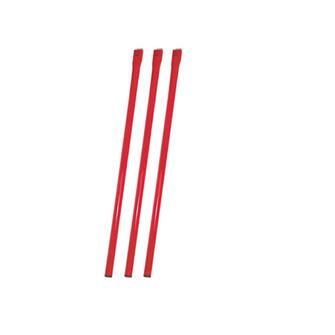 With double perforation of its inside rings, the flames come out of each side of the tubes. 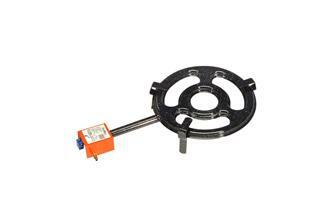 Pro paella burner - 30 cm with thermocouple for use indoors. With double perforation of its inside rings, the flames come out of each side of the tubes. 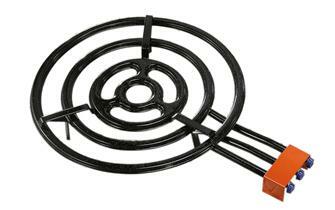 Pro paella burner - 40 cm with thermocouple for use indoors. With double perforation of its inside rings, the flames come out of each side of the tubes. 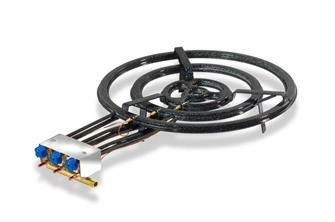 Pro paella burner - 50 cm with thermocouple for use indoors. With double perforation of its inside rings, the flames come out of each side of the tubes. 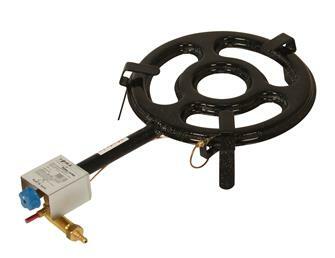 Pro paella burner - 70 cm with thermocouple for use indoors. 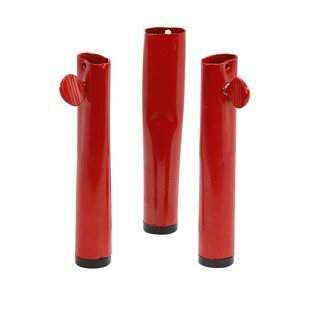 With double perforation of its inside rings, the flames come out of each side of the tubes. Paella set for outdoor cooking. 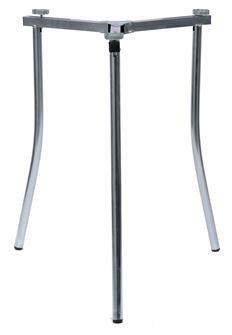 Adjustable stainless steel screen for paella heaters that are 60 to 700 cm in diameter.